Langley is an Imperial guard and captain of the Anvil City Watch. Langley considers his job easy, saying, when asked about Anvil, "Pretty, isn't it? And quiet. Not much work for us." This may be why Countess Umbranox is planning to demote him and receive a new captain from the Imperial City, acted out in Taking Care of Lex. His daily routine definitely backs up his statement as he rarely leaves the City Watch Barracks and even cancels his minor outdoor duties if it is raining. The Barracks are located in the tower behind Jesan Sextius' house near the Dock Gate and Langley sleeps there every night between midnight and 6am. On weekdays (Morndas to Fredas) he spends the mornings strolling lazily around the sleeping area, at times chatting with the busy guards. At midday, if the weather is dry, he leaves and spends three hours patrolling the northeastern part of town, specifically the area near the pond and Benirus Manor. If it is raining, he stays inside, waiting for the weather to clear. He returns at 3pm and spends the rest of the day inside and only breaks off his wandering when he sits down and enjoys a two-hour dinner at 6pm. On Loredas and Sundas, he never even leaves the Barracks, regardless of weather, and stays inside all day long, eating and sleeping at the usual times. During the day, Langley will equip a steel claymore and the standard Anvil cuirass along with a pair of chainmail greaves with matching boots and gauntlets. When going to sleep, he puts on a more comfortable set of randomly chosen lower-class clothing. He only carries a small amount of gold. 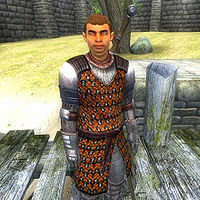 At 12am on Loredas and Sundas, Langley will receive a nightly visit from Castle Steward Dairihill. They were supposed to "sleep" together until 6am. However, most of the beds at the Barracks are single beds, and thus Dairihill will have no other option but to simply stare at him while he sleeps. Also, all the beds are owned by the Anvil guard faction, to which she doesn't belong. This page was last modified on 23 August 2018, at 00:02.